As the Association for Talent Development (ATD)/American Society for Training & Development (ASTD) 2014 International Conference & Exposition) reached its conclusion this afternoon, I couldn’t help but think about how much I forced myself to learn from it—by not being physically there. I thought I had pretty much drained the learning pool over the past few days by experimenting with virtual participation via social media tools and the conference backchannel. My own increasingly-immersive participation over the past few days had included interactions with onsite and offsite colleagues extending across Twitter, Facebook, LinkedIn, and blog posts. I had even watched and tweeted a live online broadcast that made me feel present yesterday afternoon at the formal announcement that ASTD was officially transformed, at that moment, into ATD after 70 years of successful operation as a first-rate training-teaching-learning organization; the experience became more visceral this morning when onsite attendees used Twitter to share numerous photographs documenting that all conference signage had been changed overnight to reflect the change of name. But it didn’t occur to me, until this morning, that I had overlooked the use of one more piece of technology—one so familiar that I had completely overlooked it. The moment of revelation and experimentation came when I was again reading and reacting to tweets from the conference. Among the flood of messages was one from Walt Hansmann, a long-time ASTD friend and colleague with whom I’ve presented, brainstormed, learned, dined, laughed, and groused countless times. (In fact, it was through Walt that I met Larry Straining, whose Facebook posting a week ago sent me down the path of more creatively and intensely experimenting with learning through virtual-conference attendance; ATD/ASTD really has been and continues to be pivotal in helping me understand what a small world we all inhabit and serve.) So there was Walt, tweeting about the fact that he was already wearing a new ATD pin while I was on the other side of the country thinking, “If I was there, I’d be wearing one of those, too.” And then it dawned on me: all I needed to do was try to reach him on his cell phone. Which I did. And the ensuing conversation led to his assurance that one of those pins would work its way across the United States and into my hands sooner than later. That combination of tweeting and calling may have produced the virtual-conference-attendance equivalent of the joys and rewards of meeting and learning from each other in conference hallways. More importantly in terms of the virtual-conference experiment, the call carried us back into cross-platform conference participation as he immediately posted a tweet (“@paulsignorelli @trainersleaders may not be @ #astd2014 physically, but he is sharing via SoMe [social media] and just called to touch base!”) while I was tweeting my own response to the phone conversation: “Oh, technology, with all your lovely variations: just briefly joined @WaltHansmann at #ASTD2014—via a phone call. #NoLongerLeftBehind.” I was also, at the same time, responding to another tweet suggesting that Dan Steer’s tweets had made the tweeter sorry to have missed the conference—to which I responded, “made me feel closer to it.” We closed the circle on that conversation when Dan himself—whom I’ve never met face to face—used the “favorite” option on Twitter to acknowledge my appreciation for all he had done to carry the conference far beyond the physical site of the conference. This exploration of how we might more creatively incorporate the use of social media tools into learning opportunities benefitted from a wonderful combination of resources. The fact that many ATD members are adept at synthesizing content via backchannel interactions on Twitter is an essential starting point; they were the portal to the conference for me and for others who were attending from a (physical) distance. 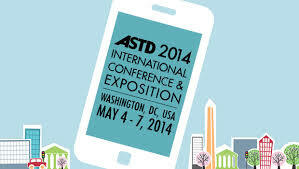 ATD’s first-rate conference app made it possible to monitor the conference schedule and access some presenters’ conference materials; that helped me see and understand what others were reacting to onsite. Having a tablet meant I could turn this into a mobile-learning/mobile-conferencing experience at times by following the backchannel feed even while I was using public transportation here in San Francisco to move from appointment to appointment when I wasn’t at home using a desktop/laptop combination. And the encouragement of training-teaching-learning colleagues provided what a successful learner needs: a great community of learning and engaged personal learning network that supports the learner’s process and explorations. There was a time, for me, when having that stimulatingly immersive experience face-to-face with conference colleagues—call it “conference high” for lack of a better term—concluded with a sense of melancholy that came from knowing I was about to leave them and wouldn’t see them again for anywhere from six to twelve months—until we were reunited for the next intensely inspiring set of learning interactions that we found through our shared conference experiences. The bouts of melancholy diminished noticeably over the past few years when it became obvious that we would be “seeing” each other far more often through our shared use of social media tools, conference calls, and interactions via Skype and Google Hangouts. But I found a different, yet parallel, sense of melancholy setting in this afternoon for the first time as we said our virtual good-byes. And I realized that it wasn’t just the coming and going of friends who interact, then are apart for considerable periods of time, that used to cause that melancholy. It’s the fact that a well-run conference or any other sort of convocation is, in and of itself, the catalyst—a special meeting of friends and colleagues to creatively explore, at a very human level, what is important to all of us; it’s a form of augmented reality that might best be described as “augmented intellectual and emotional reality.” It deepens the emotional connections that draw us together. It ignites all that is most worth cultivating within each of us. And it reminds us that without those shared community-building moments of engagement regardless of whether they are onsite or online, we would be far less than what we are. N.B. — This is the third of three interrelated articles inspired by the ASTD/ATD 2014 International Conference & Exposition in Washington, D.C. For two additional views of the virtual conference attendance experience, please see Kent Brooks’ Twitter Activity at #ASTD2014 Through Monday May 5  and Michelle Ockers’ My #ASTD2014 Backchannel Experience. This entry was posted on Wednesday, May 7th, 2014 at 4:44 pm and is filed under e-learning, technology, training. You can follow any responses to this entry through the RSS 2.0 feed. You can leave a response, or trackback from your own site.